productivity in thousands of companies worldwide; from aerospace, appliances, automotive, electronics, industrial, medical and numerous others. 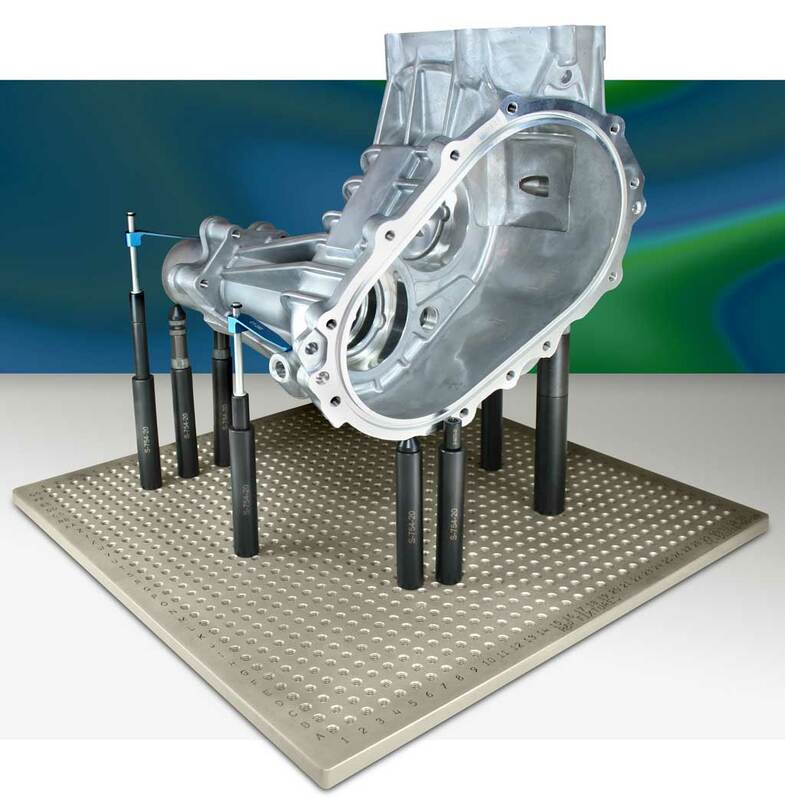 R&R can give you the complete CMM fixturing solution. The R&R Fixtures were designed to reduce the need for traditional fixturing such as glue, tape, step clamps, and reduced dedicated fixtures. It has the versatility to adapt to any application by the use of various size components and base plates. Whether it is a small medical part, an aluminum casting or large steel automotive stamping, this one fixture system has the ability to adapt to all your applications small, medium or large. With R&R Fixtures, efficiency and productivity are increased on your CMM by reducing set up time. All of our components work together and can be hand threaded into the fixture plate to nest and secure the part. The majority of components are hand tighten only and do not require any special tools which can enable the part to be set up within minutes so results are obtained sooner saving both time and money. This will reduce or eliminate the need for traditional fixturing methods that can take longer to set up than to measure the part. Documenting the original setup maintains consistency with all future setups. This is especially helpful when there may be multiple users or a lapse of time between setups. Whether a part is checked daily or only periodically, the alpha-numerically labeled plates enable accurate and consistent setups for anybody and everybody to setup the same way each and every time. R&R Fixturing enables a clear probe path for more precise measurements and better access to the entire part unlike traditional fixturing where features can be obstructed from the probe due to cumbersome and bulky part setups. Fixtures can be configured in many different ways to give you the most complete access as possible to the part. Whether a part is a prototype or production part they can be setup quickly and easily with use of the R&R Fixtures. Multiple parts can also be setup on the fixture at the same time increasing the productivity of your CMM. The flexibility of R&R Fixtures to adapt to any part makes it a necessity for inspecting parts on a CMM, saving a lot of time and money on inspection costs. Using R&R Fixtures, the payback period is months instead of years.